Love can be a fleeting moment of deepest joy, or the journey of a lifetime. 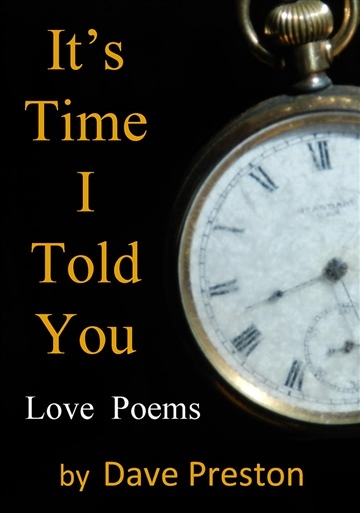 Here's a collection of love poems from all stages of the journey, some illustrated by the author's photography and artwork. The pieces range from finding and nurturing love, creating romance, through riding out the storms of a relationship, to acceptance of the relationship as being beyond control. Love hurts and heals. Being in love can be the best of times, and the worst of times. I've tried here, to capture in words, some of both, but mostly the good times. This has been quite a departure for me as a writer, not that I've been a stranger to love, but because to date my work has covered almost everything but love poetry. And love has been written about so many times by so many people that I can't help feeling that it's all been said before. Perhaps it has; I just wanted to say it again. This is my first book of poetry. I guess I'll wait and see if it's my last. Anyway, love is a wonderful thing and I just think... It's Time I Told You. Dave Preston is a writer and musician, born in North Yorkshire where he lived on a farm and was raised by a mother who worries too much. After studying agriculture, engineering, and computer science he leapt across the ocean to live and work in Canada. Dave spent many years as a food columnist, entertainment reviewer, and travel writer. He is the author of five books (and contributor to several others) and four plays, as well as hundreds of newspaper and magazine articles and columns. He's an award-winning brewer and winemaker, and also admits to writing poetry. Weekends often find him playing guitar and singing in a rock and roll band (though his mother worries that he's getting too old for all this, and his knees tend to agree). He lives on Vancouver Island, BC, with far too much garden, and almost too many dogs.